Running and fun are two words that rarely come out of my mouth in the same sentance. Unless the word NOT is present. However, today I did a 5K with some friends and had so much fun. Yes I said it, I had fun running. Now if you are sitting there thinking I actually ran the whole thing well back that thought right out of your mind. I did run a lot of it but walked a lot of it too. At one point I remember saying that it looked like Houston traffic since we got all back up just after the turn around, and the pink color powder. There was no way to run through that crowd so yep I walked at that point. Ok, ok, yes there were people, the diehards, that were running through the crowd. I was not one of them. In all seriousness it was very fun and it was for a great cause. 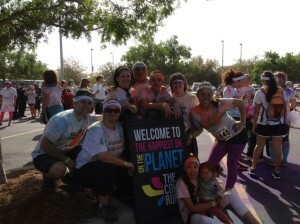 The Color Run Houston benefited Expedition Balance, which helps veterans cope with Post Traumatic Stress Disorder (PTSD). There is another 5K next month very similar to this one that I’m hoping to do with the group again. Maybe I’ll even try to run the whole thing, and then again maybe it will be like Houston traffic too and be unable to run. Yes that is wishful thinking on my part. Let me know what your thoughts are on running? Love it or hate it?